There's a lot packed into David Moles's dense, brilliant alternative history novella Seven Cities of Gold : Mayan mythology, New World American folklore, a re-imagining of Conrad's Heart of Darkness (and Coppola's Apocalypse Now ), a meditation on the disasters of the last decade—Iraq and Katrina—as well as the numerous geopolitical upheavals of many decades before. There's also a complete re-imagining of religion as it is currently perceived by Western audiences: here Islam and Buddhism are the religions of the power elite while Christianity occupies a literal and figurative backwater. That Moles manages to present this alternate world so convincingly in a mere seventy pages is bound to result in accusations of genius. Indeed, if there's one flaw here it's that the book may be too smart for its own good. Readers of Heart of Darkness or watchers of Apocalypse Now will quickly glom onto Moles's narrative model. There are, indeed, so many verbatim—or near enough—exchanges from Coppola's film that one might think this story but a clever homage (Moles's take on Martin Sheen's famous "Who's in charge here?" is particularly well done). But the details Moles gives us as Nakada sets out up the war torn river Acuamanga (read: Mississippi) into the heart of a demoralized alternate American heartland reveal that he's after something different. Even if you don’t read the introduction by Seven Cities of Gold 's publishers, which outlines the precise events Moles has changed (or is referencing) in his creation of an alternate twenty-first Century, the parallels to Hurricane Katrina in this description are obvious. On this same page Nakada and her crew witness "a lone yellow Ministery flatboat" passing water barrels to disenfranchised Christians standing on the roofs of their sunken houses. Yet, while Moles undoubtedly wants us to reference events with which we are familiar, he is far too smart for a one-to-one allegory. Instead, he uses the Katrina motif as a point of entry into a much broader meditation on the destructive nature of War itself, regardless of time, place, or cause. Evidence for such universality is born out by the way in which Moles parcels out information. As we travel upriver the Katrina motif gives way to more generalized destruction recalling no specific locale but all locales made unrecognizable through acts of war. "Of the canals indicated on the charts," Moles writes as Nakada reaches the outskirts of Espírito Santo "there remained only a vague geometry picked out in burnt pilings that rose here and there among oily slicks of garbage." (p. 21) There are "no living people" and whatever infrastructure existed is "simply gone." Moles's prose is always tight and vivid and his worldbuilding is superb. While the specific backstory of the seven escaped bishops is based on a historical incident that (I strongly suspect) most readers will be ignorant of, the day-to-day details of his alternate world convince you of its reality. A nurse opens a med-kit marked "Remedies (Lower-Class)" (p. 2), suggesting profound social inequality. Characters ride in "coleopters" over vistas of destruction and answer to the titles of Nutritionist-Sergeant and Abbot-Doctor. Moles may be riffing on Coppola, riffing on Conrad but he's really channeling Orwell: the war Nakada finds herself in is all-encompassing, a way of life. The ever present water as she travels upriver—hissing rain, foaming channels, rising floods—suggests a fallen realm, already judged and found wanting—and acts as a potent metaphor for a protagonist long since set adrift from normalcy by prolonged exposure to the theater of war. Though Nakada is by far the most developed character—the brevity of the story doesn’t allow for other characters to resonate beyond a few telling strokes—she is brought to life with deftness and subtlety. An opium addict, it is strongly implied that she numbs herself not from a desire to disengage from her blood-soaked reality, but to pass the empty hours between conflicts. As we learn in an excerpt from her pillow-book (and could Moles have chosen a more thematically significant device to represent her dying soul? ), she has become dependent upon war to give her life meaning. …after that tour, something broke. I went back to Japan, and I wandered around like a sleepwalker…I stood in the Kokura Main Station, watching the salarymen and the office ladies stream through, lucky and oblivious, and wondered what I was doing there. I imagined earthquakes, incendiary bombs. Imagined…the commuters trapped under burning beams, screaming for help. My help. Once again we recall Martin Sheen's Captain Willard, wishing he were back in the jungle. It is fascinating to see how Moles takes familiar pop-culture icons and classical narratives and reshapes them into something distinctly his own. This is both the joy and curse of Seven Cities of Gold for, occasionally, Moles's blending of so many elements goes over our heads—at least as far as the interpretation of the novel prescribed by its publishers is concerned. As mentioned above, a specific interpretation of Seven Cities of Gold (and I’m not sure any novel really needs one) relies on the information provided in the publisher-written introduction. I did not read this introduction my first time through and am not afraid to admit that I did not draw the intended connections. Moles's portraits of destruction and the familiarity of Nakada's situation are enough to make the novel work but the finer worldbuilding hints disguised in Moles's deliberate obfuscation of place-names and geography (Acuamagna for Mississippi is not an easy connection) leave one unable to read the novel "as a meditation on 9/11, the War on Terror, Iraq, Hurricane Katrina, and much besides" (p. ii) or even to place its exact locale unless expressly instructed. Once I did read the introduction my understanding of the nuances of Moles's worldbuilding and plot improved—but I still can't help but feel that a prescribed interpretation is neither helpful to the novel (why couldn’t Moles express these apparently important points without Cliff's Notes? an intrepid reviewer is bound to ask) nor even in keeping with Moles's vision of war as a force for evil regardless of specific cause or participants. I can only conclude that Moles's publishers decided he was a writer too smart for traditional mass consumption and acted accordingly. This is partially true—particularly when the reader comes up against the sheer scope of Moles's religious research. From the hooded participants in a street mass to statues of the Bodhisattva Kanzeon the novel is a veritable smorgasbord of religious ritual and iconography and the chances you will understand the significance of each and every reference are probably not on par with the author's. This becomes particularly irksome towards the end of the novel in which (ironically, in a novel that highlights Eastern religious practices) the final showdown between Nakada and Dos Orsos is muddied by the latter's delivery of an unintelligible evangelical sermon. "And I heard," Dos Orsos quotes ranting madly (sadly?) to Nakada at the end of an (equally unintelligible) religious ritual "as it were the voice of thunder, one of the four beasts saying: Come and see, and I saw…" (p. 65)). But see what, exactly? The inevitability of apocalypse in a fallen world? A new awakening of consciousness as Nakada realizes a secret about what she was really sent to do? Moles, at the last moment, plays it too close to the chest. His final image, which borrows heavily from that of the Biblical flood, can, like the rest of the novel, be read a number of ways. Which still does not make the novel a failure. Far from it. It is indeed the many applications to which you can put Moles's work which makes it a success. 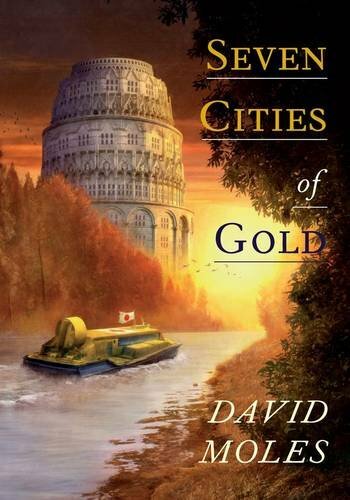 While Seven Cities of Gold is indeed brainy, vast in scope and riddled with cues from a number of real world and literary sources, its war-torn imagery and situations need no justification—and no primer as to the application of their deeper meaning. Whether, at the end, we are climbing to heaven or descending into hell, it is man's appetite for destruction that is—and has been—powerfully on display. The ending, ambiguous, infuriating or otherwise, is beside the point. I have just, finally, got around to reading this, which is rather shameful when I consider how much I generally rate Moles' fiction, how much I was looking forward to this story in particular, and how highly it was praised; and it struck me as really very good indeed. And I actually managed to skip over the publisher's long blurb/introduction, which left the story to find its own weight in my mind, which I fully agree with you it deserves to do. One little additional thought is that, in addition to the antecedents you cite, having read Ballard's The Drowned World for the first time earlier this year, Seven Cities of Gold struck me as quite strongly Ballardian: in its vivid specificity, in the way it is decoupled from reality yet inseparable from it, in its claustrophobic intensity.